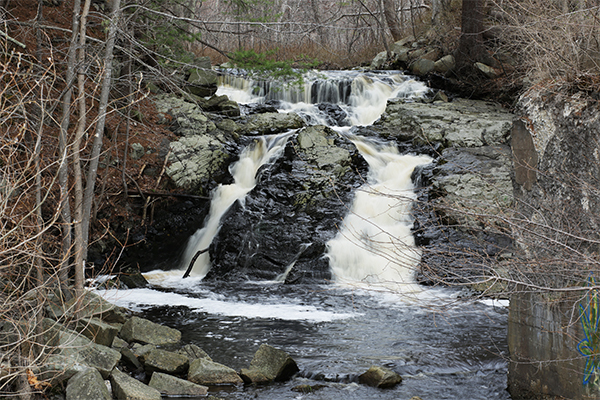 Most of the southern Maine coastline is low in elevation, yet there are a few waterfalls still in existence. This particular falls is located right off US-1, although only a few of the thousands that drive this highway on a daily basis know that the falls are actually there. You can partially see the falls while driving, but only if you focus real hard and know where to look. The first thing you are apt to notice at these falls is the presence of graffiti on the rocks and remnants of a dam from the 1640s. 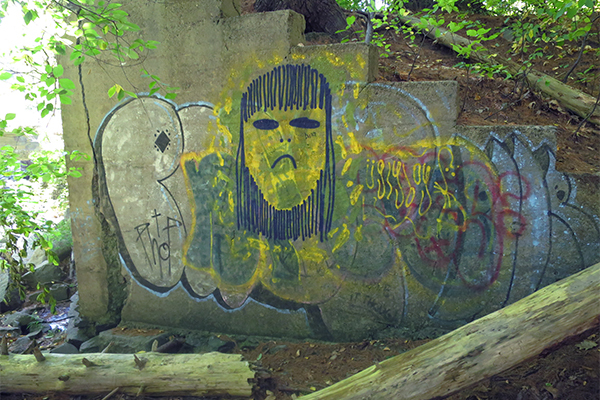 It's incredibly upsetting to see the graffiti here, but I think that the falls are still attractive enough to visit. Visit the falls in the spring for the best waterflow and before the leaves grow in and partially obscure the falls all the way until they fall in autumn. From the parking area on the western side of US-1, walk the short paved path in front of you to the falls. The entire walk is less than 100 feet. An old wooden bench in front of the parking area provides a nice heads-on view of the falls. The land surrounding both sides of the falls is private property and you will see signs attesting to this fact. However, there is a rough path to the left of the falls that you can scramble up to get a better view of the falls. Don't go too far though, as the land becomes private property beyond the falls. From I-95 in Wells, take exit 19. Follow ME 9 east / ME 109 south for a short distance to US-1. Turn right onto US-1 south. Follow US-1 south for 1.6 miles and take a right onto Buffum Hill Rd. Buffum Hill Rd is found right after you cross over the Webhannet River on US-1. 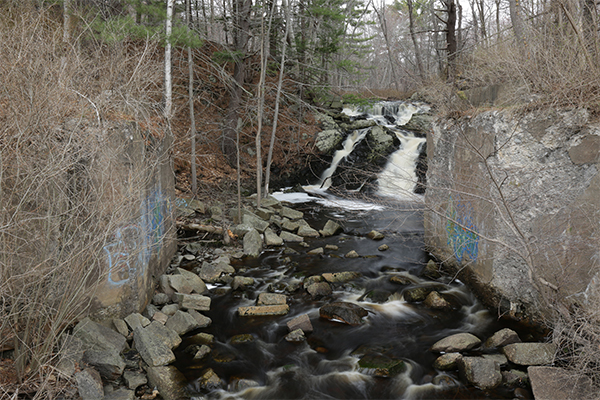 Once on Buffum Hill Rd, take an immediate right and drive along a short road marked as 'Falls Park'. Follow this road for about 300 feet and you will find the designated parking area at the end of the road. There is also one parking spot on US-1, but it is much safer to use the designated parking area.